This topic is very emotional for me, but I felt compelled to share my story about my experience with hair loss after I had my baby last June, in hopes to help many who suffer from hair loss after having a child. It's something that you don’t want to think about, but it happens and it's okay-- natural, even. The day I saw my edges literally fading away, I cried! Like a baby might, I add! I was an emotional wreck with my hormones all out of whack, and on top of that my hair was falling out. I kept it under wraps though, because I was too embarrassed to let my readers or instagram followers see my hair loss. I don’t have pictures that show my thinning edges. I was just simply too emotional to take pics. Every time I would wash my hair I could really see how short my edges were. I hid it from everyone. You are probably reading this like, “Wait, what? Her edges fell out? But her hair was still on point, tho". I knew all too well, actually. I kept my edges very slick with the help of edge control and scarves to help lay down what little I did have! I began researching about postpartum shedding and reading up on how to help your hair get back to its healthy state. I decided to give the Shea Moisture Jamaican Black Castor Oil Line a try, what could it hurt right? OH MY! When I say my edges have not only started to grow to a nice length, my hair is noticeably stronger as well. I used the edge treatment especially, on my hair line. I also researched and learned that JBCO helps with hair growth as well. Here are a few of my tips and techniques I tried to help with my post partum hair loss. JBCO- Known to promote hair growth, also helps thicken hair. I used this to massage my scalp. Wait it out- Take it day by day. I was told that it wouldn’t last forever and that my hair would get back to how it was soon. Through this experience I gained even more patience. Even though I have been natural since 2009 I’m still on a journey, I’m always learning. Even though I was bummed at first I learned to accept that things happen and most of the time I can’t control them, and its ok :). 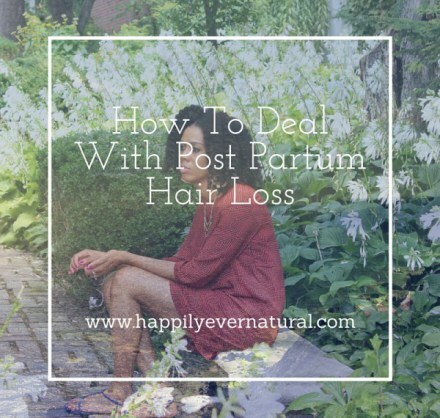 Did you experience Postpartum shedding or hair loss? How did you deal with it?